Daniel Defoe's fictional heroine Moll Flanders is famous for her criminal and sexual adventures, racily portrayed in big and small screen romps as bawdy wench, fallen woman and proto-feminist trailblazer. But who was she? And what world did she really inhabit? To answer these questions Sian Rees takes her readers on a journey of literary and historical detection, across continents, cultures and centuries. Following Moll's tumultuous life, the story moves from Jacobean England to Jamestown, Virginia; from the English Civil War to the struggles of the Powhatan Indians; and from the metropolis of London to the hamlet of Annapolis in the early eighteenth century. 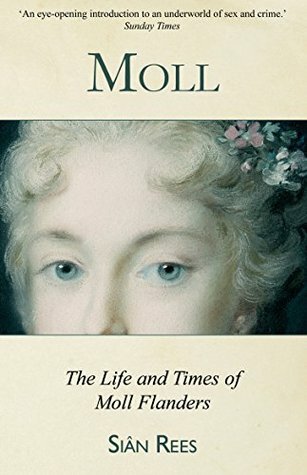 It's been quite a few years since last I read Moll Flanders; however, I do remember the story pretty well, and that is what prompted me to request this title from NetGalley. It was fascinating to see some of the historical figures and situations that inspired Defoe's tale, looking at the truth behind the legend, as it were. This title will appeal to those who enjoy Defoe's story, but it is also a great resource for historians interested in 17th century criminality during the age of transportation, as well as those who wish to learn more about early colonial life in America. Overall, Moll: The Life and Times of Moll Flanders is an insightful and lovely read.